"World peace for dinner," mused Mik, scratching his beard stubble. "Does that come with fries?" Finally Karou has her hope firmly in her heart and her allies close by her side. There's a new threat and it amazingly causes a temporary peace between the Chimeara and a certain group of Seraphim called The Misbegotten. Of course there's a lot of hardship with two warring people trying to get along, but it is also beautiful to see such life-long revenge turn into a tentative alliance. With the groups together, they are far more powerful than apart. It's one of my favorite things to see previous enemies team up to fight a greater threat. 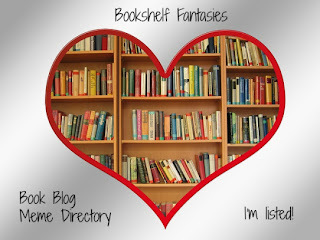 In every book I feel like I add a new favorite character while still loving the ones from previous books that earned a place in my heart. In this one, Liriz joined the large group of Karou, Akiva, Zuzana, Mik, Issa, and Ziri that I already adored. It's been so great watching the growth of these characters. There was a lot of humor sprinkled throughout in the midst of this war that came from a variety of characters and had me giggling while reading. I enjoyed a few surprises as well as some back-stabs from characters that I wasn't expecting it from. I actually really disliked the Eliza parts all through the beginning and got to the point where I was just skimming the sections following her. It wasn't until later when her part to play became clear that her scenes were enjoyable for me. It's apparent that these two should really be together, so when Akiva and Karou finally acknowledge that they belong together, it feels right. I'm beyond thankful that there's no love triangle in this series to speak of and throughout it all they only cared for each other. I was also thrilled to see a new romance blossom between some other favorite characters. 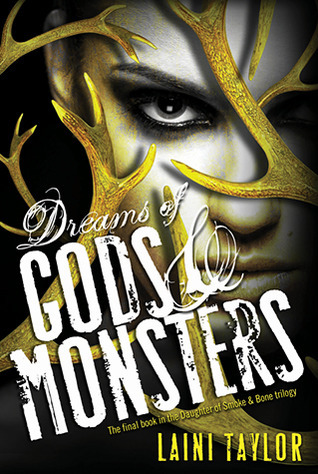 Dreams of Gods and Monsters is packed to the brim with action and twists, betrayals and unexpected allies, and ends on a note that suggests the story could continue. It's not all neatly wrapped up with a bow, and that's ok. It's a satisfying ending to this exquisitely written series. Karou looked to him, found his eyes waiting for hers, and met them with a sting of clarity that was the final dissolution of the lie. It mattered. They mattered, and whatever it was that had made them not kill each other on Bullfinch beach all those years ago...mattered. "We have so many enemies, Lisseth," said Karou, keeping her voice light. "Most of them are our birthright, inherited like a duty, but the ones we make for ourselves are special. We should choose them with care." "The future is shadowed, and I can promise you nothing beyond this: We will fight for our world to the last echo of our souls, and if we are very strong and very lucky and very smart, we may live to rebuild some of what we've lost.